Who Am I? A Lower Elementary Production. Pathfinder - An Overnight Experience! 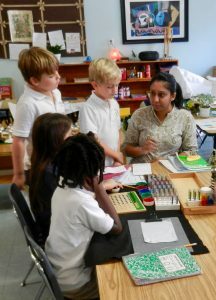 The Montessori Children's House of Hyde Park elementary school program is divided into two classroom environments: the Lower Elementary Classroom (Ages 6-9) and the Upper Elementary Classroom (Ages 9-12). This six year curriculum follows the guidelines established by Dr. Maria Montessori, which is based on the developmental needs and challenges of children in this age group. Children move from the first plane of development and into the second plane of development at about age six. As students progress into this second plane of development, they begin to demonstrate the ability to reason, understand the abstract, have a vivid imagination and an innate desire to explore. At this developmental stage, students desire to work in small groups and interact with their peers. Our classroom environment is specifically designed to promote free verbalization and movement among the students. This enriches their emerging social lives, expands their moral orientation and boosts their intellect. Working together also teaches them appreciation for group collaboration and promotes their natural desire to become constructive members within their community. Children in the Lower Elementary Classroom find a love for learning. 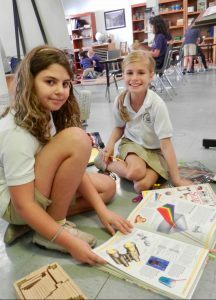 Our program encourages them to wonder, question and explore. 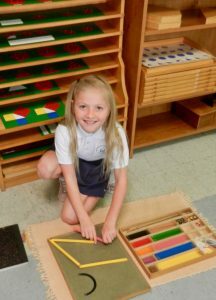 The Montessori curriculum includes math, geometry, science, botany, zoology, language, geography, and history. Students also learn computer skills, have instruction in Spanish, and participate in weekly physical education programs. In addition to the classroom work, our curriculum is also supplemented with several educational field trips. 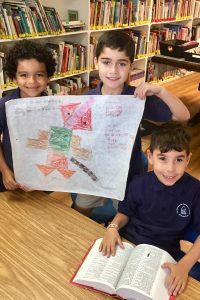 Students in the Lower Elementary Classroom form academic and personal goals, learn time management and organizational skills, engage in ethical problem solving and consider matters of justice and mortality. Our program fosters self-confidence, independence, and resourcefulness. It also guides children to become productive and contributing citizens.